Spanning more than 663,000 square miles at the far northwestern coast of North America, Alaska is both the largest state in the United States and the least populated by density, known for its expansive undeveloped natural areas. The state’s diverse terrains and ecosystems include majestic snow-covered mountain ranges, lush forests, elegant stretches of tundra, and some of the last remaining glaciers in North America. Sites such as Denali National park offer outdoor adventures such as hiking, rafting, and rock climbing, while port towns such as Seward are filled with quaint tourist attractions for visitors arriving on cruise ships. The state is also known as one of the top fishing destinations in North America, offering chances to catch five varieties of native salmon, along with species such as halibut and rockfish. These Alaskan resorts are among the best for visitors looking for true wilderness adventures, with some offering luxury ski resort amenities in all-inclusive settings and others providing opportunities for up-close wilderness adventures right on the lakefront. Tordrillo Mountain Lodge offers the state’s best heli skiing experiences within the stunning Tordrillo mountain range, known for its consistent deep snowfalls and stable weather conditions. The lodge, which is located approximately 40 minutes by air from Anchorage, has been named a top world heli skiing destination by CNN and is co-owned by Olympic skiing champion Tommy Moe. Rustic guest rooms and suites are offered at two main lodge buildings, while private canoe, ski, and lakeside retreat cabins upgrade to prime amenities such as floor-to-ceiling windows, private chefs, and use of lodge helicopters. 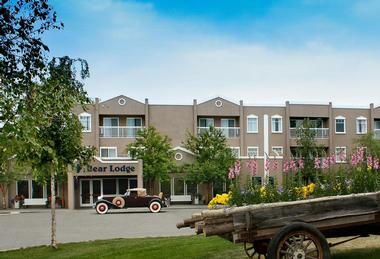 Onsite lodge amenities include lakeside hot tubs and saunas, professional massage services, and 500-bottle wine cellars. In addition to its skiing, the lodge provides access to a full slate of summer and winter sports activities, including snowshoeing, fat biking, ice and rock climbing, jet skiing, and mountain biking. 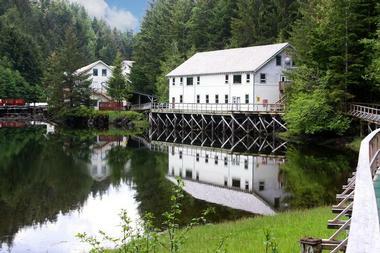 Waterfall Resort is the state’s most popular fishing resort, located on a 52-acre former historic cannery site on Prince of Wales Island. The resort, which is only accessible via plane or boat, draws top anglers from around the world to catch king and silver salmon and halibut, including regular stays by professional fishermen and celebrities. Ocean or lake view lodge rooms or egg house suites offer private bathrooms and amenities such as coffee makers and mini fridges, while beautiful boardwalk cabins and Tongass townhouses upgrade to more private accommodations. Onsite amenities include a full-service general store, a dining room serving daily hot buffet-style breakfasts and dinners, and an onsite bar and lounge offering craft beer and top liquors. Kachemak Bay Wilderness Lodge is a family-owned lodge within the heart of Kachemak Bay State Park, located along the shores of the China Poot Bay, and has been highlighted in international publications such as the New York Times and National Geographic. Five mountain and ocean view private cabins accommodate up to 12 weekly visitors, furnished with custom woodwork and stained glass and decorated with the work of local artisans. Guests are greeted with fresh flowers, fruit baskets, chocolates, and wine and have access to top in-room amenities, including personal bathrobes and luxury bedding. Custom chef-prepared fare is served at the resort daily, using items grown at the lodge’s personal greenhouse and garden. All guests receive personally-tailored itineraries for activities such as hiking, fishing, kayaking, and wildlife watching. Afognak Wilderness Lodge is the only private overnight residence within Afognak Island State Park, offering one-of-a-kind outdoor adventures within the Kodiak Islands. The lodge has been in operation since 1974 and accommodates up to 12 overnight guests in rustic, remote cabins featuring modern amenities such as satellite televisions and free wireless internet. Daily meals are served family-style at the resort’s main lodge, and packed lunches are offered for visitors embarking on daily adventures. A wide variety of fresh and saltwater fishing opportunities are available near the lodge within the state park and along the island’s shores, along with opportunities for spectacular photography and wildlife watching. 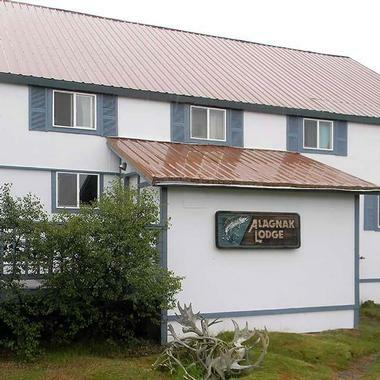 Alagnak Lodge was opened in 1984 by four fishermen who wanted to provide more convenient visitor access to the Alagnak River, one of Alaska’s finest sport fishing rivers, which is noted for its rare population of all five Pacific salmon species. 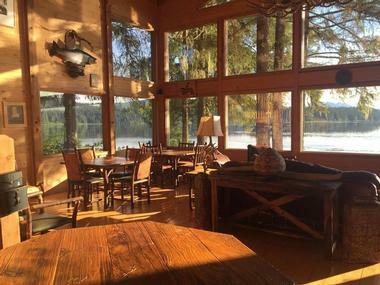 Today, the lodge is located along the river’s tidal section approximately 25 miles from the town of King Salmon and features 12 single and double guest rooms with simple decor and amenities such as 24/7 electricity and modern plumbing. A main lodge area serves made-to-order breakfast, hot lunch, and upscale dinner items such as prime rib and seafood dishes in an all-you-can-eat buffet setting, and several communal rooms offer chances for television viewing, reading, and other quiet activities. The lodge’s river fishing area, which is only accessible via plane, offers a polyethylene EZ Dock, and opportunities for fly outs within the Bristol Bay watershed area are available. 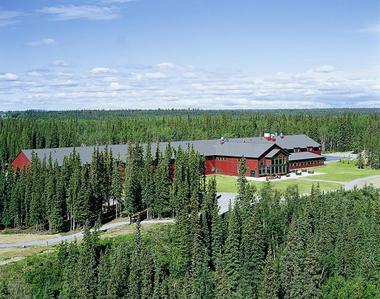 Bear Lodge at Wedgewood Resort offers a wilderness refuge just minutes from the resort attractions of Fairbanks, located on a 105-acre property that includes the Wedgewood Wildlife Sanctuary, a 75-acre nature preserve. 157 stylish guest rooms are offered at the summer-only hotel, offering private balconies and modern amenities such as mini fridges and coffee makers. One and two bedroom suites on the property also upgrade to full kitchenettes and private living space for extended stays. 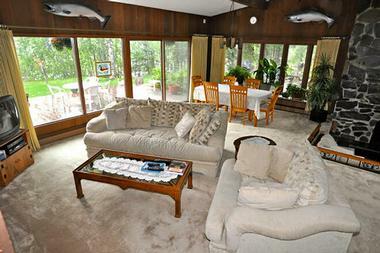 For dining, the hotel offers a full-service Golden Bear Restaurant and a relaxing Bear’s Tale Lounge. Other attractions on the resort’s property include the Fountainhead Antique Auto Museum, the Alaska Activity Island, and the Taiga Center. 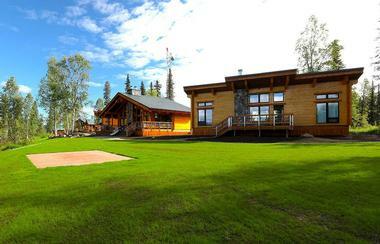 Bear Paw Adventure is located on Alaska’s Kenai Peninsula, approximately 20 minutes from the city of Homer. 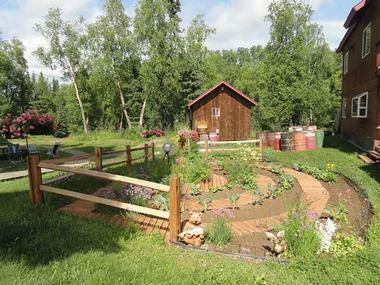 The 14-acre resort offers four rental log cabins set against the backdrop of a spruce and alder forest that has been kept largely undeveloped to create a quiet natural wilderness respite for visitors looking to experience the true Alaska outdoors. Renters can choose from the resort’s Bear Den Vacation Home, Captain Cook Lodge, Moose Cabin, or Wise Old Hunter Lodge, which sleep four to 10 guests and all showcase historic decor, fully-stocked kitchens, satellite televisions, and gas grill barbecue decks. Wilderness adventure guided excursion packages are available as add-ons to nightly stays, including salmon and halibut fishing excursions. Chena Hot Springs Resort is the centerpiece attraction of the Chena Hot Springs region, which was discovered in 1905 and has been internationally renowned for its therapeutic natural geothermal springs. The 440-acre resort, which has been in operation since 1911, is operated as a year-round modern resort complex today, offering 80 spacious guest rooms and suites within its Moose Lodge facility. A seasonal campground offers use of Mongolian-style yurts, and six cabins provide private accommodations for larger travel groups. All guests receive complimentary swim and soak passes to the resort’s indoor and outdoor spring-fed pools and hot tubs, many of which provide spectacular views of the region’s winter aurora borealis. Other onsite attractions include the Aurora Ice Museum, the largest year-round ice museum in the world, which offers guided tours and drinks at a custom-made ice bar. Ultima Thule Lodge has been featured in major international publications such as National Geographic Traveler and Outside Magazine and is one of Alaska’s premiere adventure lodges, offering customized outdoor excursions with every guest stay. The lodge is located more than 100 miles from the nearest road, offering a true wilderness experience near the mighty Chitina River and its surrounding mountains. Five private cabins accommodate up to 12 guests total per night, furnished with Craftsman furniture, overstuffed beds, and cozy private sitting room areas. A main lodge serves gourmet meals daily prepared with prime Alaskan seafood ingredients, with custom meal preparation available for guests with dietary concerns. All adventure packages are personally scheduled for each guest and can include excursions such as air safari, glacier exploration, rainforest hiking, and salmon and trout fishing experiences. 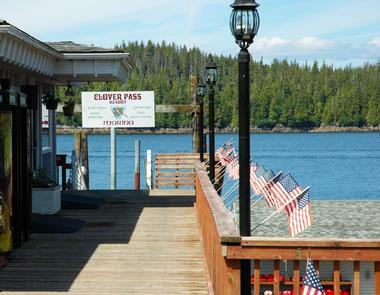 Clover Pass Resort has been offering world-class fishing expeditions since 1951 in the waters surrounding the city of Ketchikan, which has been nicknamed the “salmon capital of the world” for its amazing populations of chum, king, silver, and sockeye salmon. The resort offers 30 guest rooms with private bathrooms and views of the nearby Clover Passage, with all rooms providing convenient access to the resort’s marina. 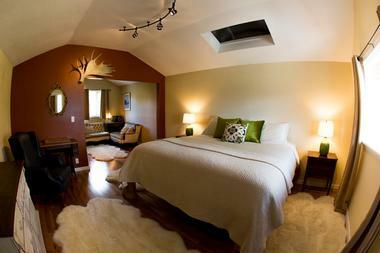 Each room accommodates up to four guests nightly. Guided fishing charters take guests out on daily fishing excursions, while boat rentals allow for private exploration of the region’s waterways. Fishing equipment and daily meals are provided with each night’s stay, and freezing services for all daily catches are available at the marina. Copper River Princess Wilderness Lodge is located on 200 acres along the eastern end of Wrangell-St. Elias National Park, which showcases more than 13 million acres of breathtaking wilderness landscape, including several of North America’s largest volcanoes. 85 comfortable guest rooms are available for guest rental, featuring simple but modern amenities such as cable televisions and hair dryers. A two-level dining area is offered, showcasing the elegant Two Rivers Restaurant on one floor and the casual pub-style Whistle Stop on the other, which offers a full drink menu and outdoor patio seating. Additional tour activities are available as reservation add-ons, providing opportunities for hiking, boating, and fishing experiences within the national park. Deep Creek Fishing Club was originally opened in 1989 by owners Steve and Vivian Moe and has become a world-renowned destination for prime Alaska fishing in part due to its features on the television programs North to Alaska and Inside Sportfishing. The 14,000-square-foot resort club complex offers a main oceanfront lodge facility and a number of spacious seaside cabins for guest rental, furnished with king-sized hickory beds, satellite televisions, and private bathrooms. Gourmet breakfasts and dinners are served daily at the lodge’s main building, featuring high-quality ingredients such as USDA prime beef and king crab. All-inclusive weekly rental packages and guided excursion fishing trips are available to make stays even more memorable. Denali Backcountry Lodge offers all-inclusive seasonal accommodations within the beautiful Denali National Park and Preserve, open for reservations between June and September. The lodge has been named as one of National Geographic’s top 10 adventure lodges throughout the world and offers a unique chance to experience the best outdoor experiences Alaska’s wilderness has to offer. 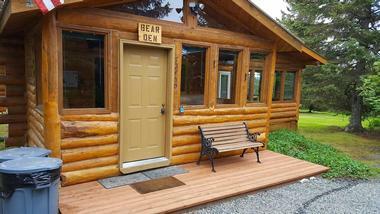 42 cozy heated cedar cabins are available for rental, featuring private baths and blackout curtains. Daily meals are served at the lodge’s two-story main building, and holistic pampering services are available at its Nest Spa and Wellness Center. Naturalist-led programming is offered daily, including natural history speakers, ranger-led walks, and fishing and mountain biking excursions. Favorite Bay Lodge is located on Admiralty Island and provides unforgettable saltwater fishing experiences in an environment that is heavily populated with all five species of wild Pacific salmon. 12 uniquely-designed guest rooms are offered for overnight stay, furnished with native cedar wood elements and handcrafted rugs. A lodge great room offers a guest library and workstation overlooking majestic views of the nearby bay, and an exhibition kitchen prepares specialty individual meals showcasing prime Alaskan and Northwestern cuisine, including full prepared-to-order breakfasts with each night’s stay. Coast Guard-certified tour guides take visitors on angling expeditions via canoe or kayak, with complimentary fish processing available for all catches. Glacier Bear Lodge is centrally located in Yakutat and is easily accessible via daily Alaskan Airlines flights, offering a true wilderness experience along the Situk River. The lodge was originally opened in 1973 and organizes daily seasonal fishing charters for salmon, halibut, and bottom fish, with cleaning, freezing, and boxing services offered for all catches. 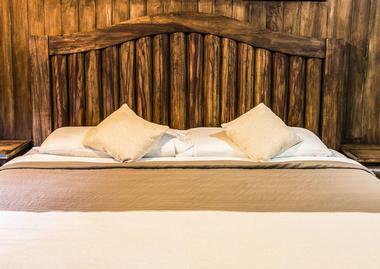 31 double bed rooms are offered, featuring private bathrooms and modern amenities. Continental breakfast, lunch, and dinner are served at the lodge’s dining room, showcasing homemade breads and desserts and menu items prepared with Alaskan seafood, and a full-service bar, game room, and dance floor are provided for guest entertainment. 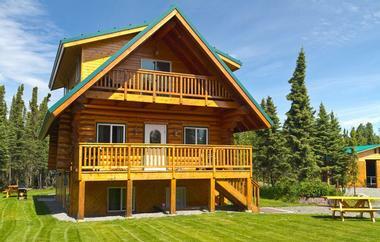 Great Alaska Adventure Lodge is situated on the site of a 1947 homestead formerly owned by the family of lodge owner Kathy Haley. The lodge is the premiere resort on the Kenai River, offering access to ¼-mile of wade fishing experiences along a 25-acre riverfront stretch. 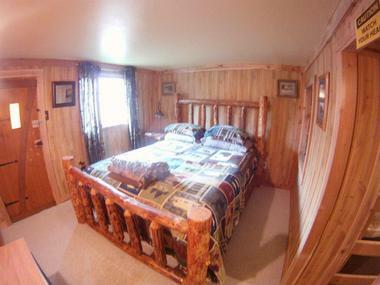 A main lodge offers twin and queen bed guest rooms overlooking the Kenai Mountains, featuring private baths and fireplaces. 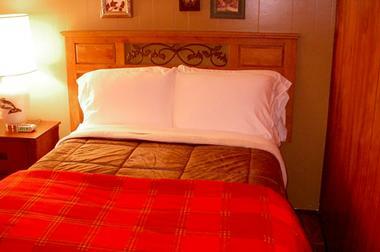 Nine multi-room visitor cabins are also available, serviced by daily housekeeping and 24-hour laundry services. Complimentary coffee is delivered to rooms and cabins each morning, and a “nearly-world-famous” happy hour serves hors d’oeuvres every evening. Cruise ship pickups and day trip arrangements to nearby attractions in Anchorage, Seward, and Whittier are available upon request. Jimmie Jack's Alaska Fishing Lodges are a family-run business that operates two visitor fishing lodges on the Kenai Peninsula, including the original Jimmie Jack’s Alaska Fishing Lodge, which is located along a bluff overlooking Cook Inlet. The original lodge provides cabin accommodations up to 20 guests at a time and provides complimentary breakfast, lunch, and use of communal campfire pits for dinner fish preparation. The business’ newly-acquired five-star Alaska SeaScape Lodge also offers all-inclusive resort stay packages in eight lodge rooms and suites, serving fine dining emphasizing Alaskan seafood ingredients. Single-day fishing charters lead visitors on Kenai and Kasilof River excursions, including fly-in fishing trip options. Kenai Princess Wilderness Lodge offers bungalow-style accommodations near the pristine Kenai River, perfect for serene nature getaways and access to area outdoor adventures. 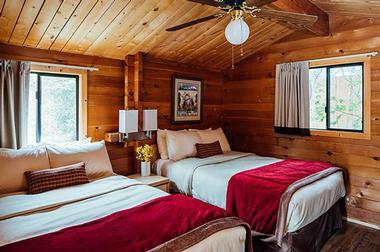 Each lodge room is furnished with amenities such as cable televisions and hair dryers and features private sitting areas, wood-burning stoves, and tranquil personal porches. 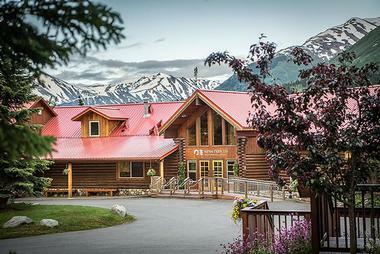 The lodge’s main building serves gourmet dining at the Rod and Reel Restaurant, which offers a fully-stocked wine cellar, and proves relaxation opportunities at the Rafter’s Lounge, which serves local Alaskan microbrews and craft cocktails. Nearby, the Kenai Nature Trail offers opportunities for guided and self-guided nature hikes and backcountry gold prospecting tours. Kenai River Drifter’s Lodge is located within the hamlet of Cooper Landing, a former frontier gold mining town that has been transformed into a destination for world-class fishing. Five individual guest rooms are available for rental within the lodge’s main building, which may also be rented together for large group stays. Riverside cabins are also available, offering use of the lodge’s amenities, including a common living room, dining room, library, and deck. Continental breakfast is served with each night’s stay during the summer months, and a riverside campfire is held nightly for cooking and sharing each day’s catches. Package fishing excursions are also available as add-ons, led by local rafting guides. 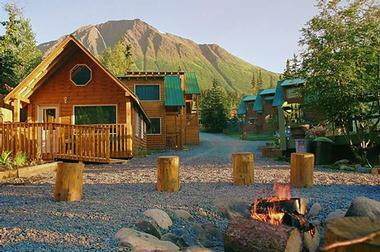 McKinley Chalet Resort is located near Denali Canyon and the Nenana River, providing easy access to the attractions of the 6,000,000-acre Denali National Park via a seasonal national park shuttle. More than 400 luxury guest rooms and suites are offered, featuring private balconies and modern amenities such as flat screen televisions and coffee makers. Two full-service restaurants are offered at the resort, including a fine dining restaurant and a casual lounge and bar, and a grab-and-go espresso bar provides fuel for daily adventures. 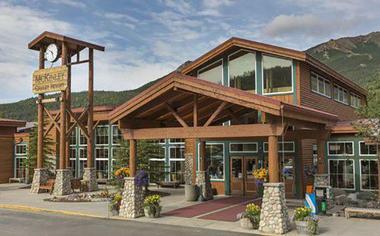 The resort’s Denali Square complex, opened in 2016, also offers nightlife opportunities, including live entertainment and a public house. Northwoods Lodge is accessible only via air or water travel and is located along the banks of Fish Lakes Creek, offering three standard and three deluxe visitor cabins for rental. All cabins offer satellite televisions and private decks or porches providing lake views, with private bathrooms available in deluxe cabins. The lodge is a fully green facility, featuring solar energy panels and a resort-wide compost system. Gourmet meals are prepared by chef and owner Shan Johnson, emphasizing local ingredients such as Alaskan king salmon and sockeye. Buffet-style meals are served at the main lodge building’s dining room, and customized meals are available for packed breakfast and lunch for daily fishing excursions. 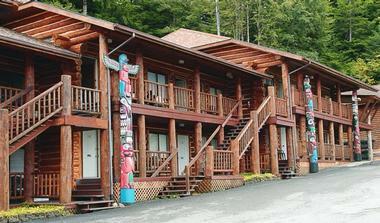 Other lodge amenities include a sauna and hot tub, a game room, and a bar and entertainment area. Salmon Catcher Lodge offers handcrafted log cabin accommodations on the Kenai Peninsula, emphasizing luxury amenities and world-class services for a unique high-end experience deep in the heart of the great outdoors. 11 custom-designed lodges sleep up to 11 guests apiece with king, queen, and sofa beds, boasting modern comforts such as Jacuzzi tubs, full laundry units, gas grills, and fully-furnished balconies. Guided daily fishing charters are led by experienced guides, and community fire pits and fish freezing services are available for use for all renters for salmon and halibut catches. Boat and flightseeing tours of area sights are also available as trip add-ons, including excursions to see the nearby majestic Exit Glacier. Salmon Falls Resort was built more than 30 years ago by professional sports fishermen with the best of world-class fishing experiences in mind. The all-inclusive resort is centrally located within the top fishing district of Salmon Falls, providing guests with an all-inclusive resort experience offering top luxuries in a classic rustic fishing lodge environment. 52 guest rooms and suites are available within the lodge’s upper and lower sections, furnished with authentic Alaskan decor and offering ultra-modern amenities such as flat screen televisions, charging stations, Keurig coffee makers, and in-room kitchenettes. The lodge’s Timbers fine-dining restaurant serves gourmet dishes such as porcini-crusted halibut, smoked salmon, and Alaskan seafood chowder, while its lounge features a full-service bar. Craft cocktail service is also available around its communal fire pit, which is available for use for cooking catches after daily guided fishing excursions. Soldotna B&B Lodge is the ideal lodge for true sport fishermen, providing easy access to the waters of the Kenai River, which boasts populations of four of Alaska’s five noted salmon species. 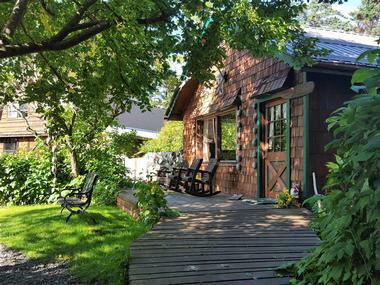 The Victorian-style bed and breakfast lodge provides spectacular views of the Kenai Peninsula wilderness from private verandas connecting to each of 16 available guest rooms. Complimentary breakfast is served each morning at the lodge’s garden sunroom, and a solarium is provided for communal guest relaxation. 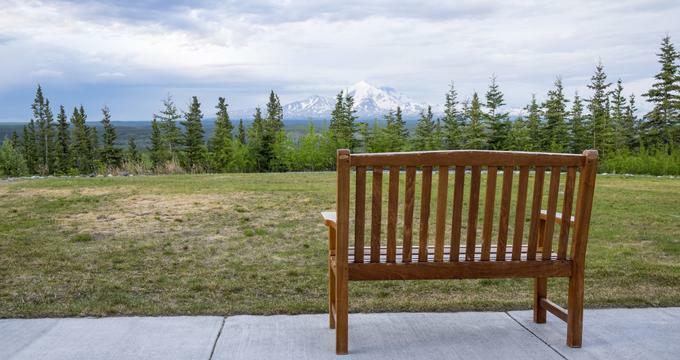 The lodge offers convenient access to the Soldotna region’s top indoor and outdoor attractions, including local restaurants, golf courses, and opportunities for mountain biking, hiking, and kayaking adventures. The Hotel Alyeska is a full-service luxury resort that opened to the public in 1994, offering some of the best ski resort amenities in the state of Alaska. The chalet-style year-round resort is located near Chugach State Park within a beautiful mountain valley offering stunning views of surrounding glaciers and ocean shoreline. Its 304 gorgeously furnished guest rooms and suites contain Serta Presidential pillowtop mattresses and offer in-room Starbucks coffee. A 60-passenger aerial tram provides access to the region’s 2,500 feet of skiing terrain, while a saltwater pool, fitness center, and full-service spa provide guests with top relaxation experiences on site. Dining experiences include the four-diamond Seven Glaciers Restaurant, the casual-service Bore Tide Deli and Bar, the Pond Steakhouse, and the Sitzmark Bar and Grill, which offers local beers on tap and live weekend entertainment.